Time Off Request in advance allows your supervisors to schedule around time when you will be away. 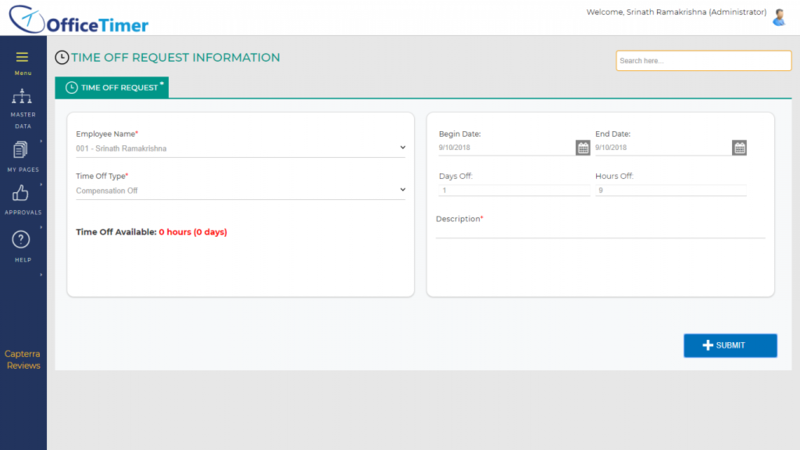 Time off request will automatically display in your timesheet under the heading “Time Off” (even before it has been approved) (with its current approval status indicated by color coding). Employee can submit[Time Off Request]from[My Time Off]page. Time off request can be make only for those “Time Off Types” in which request is enable. To add new request, click on[My Time Off]menu option available in left hand side menu. Click on[Add Time off Request]button to add Time off request. Select[Time Off Type]from dropdown in[Time off Request Information]form. Select Begin date and End date for Time Off. (After setting the dates, Days off and Hours off will be calculated automatically). Enter Days off for Time Off. (After enter the Days off, Date range and Hours off will set automatically). Enter Hours off for Time Off. (After enter Hours off, Date range and Days off will set automatically). Click on[Submit]button, to save the changes and submit it for approval. Once approved, “Available Balance” of that particular time off type will be decreased with number of hours requested in [Time Off Request]. In case of no approval require, available balance will be decreased immediately after submit. All details of your personal time off requests with their approval status, in your[My Time Off]page. User can find available balances of their assigned[Time Off Types]with their “Earned” in current period, “Consumed” in current period and “Available Balance” in[My Time Off Page]page. In[My Time Off Page],click on[Edit]link of record which you want to modify. Update your required modification in[Time off Request Information]form. In[My Time Off Page],click on[Delete]link of record which you want to delete.